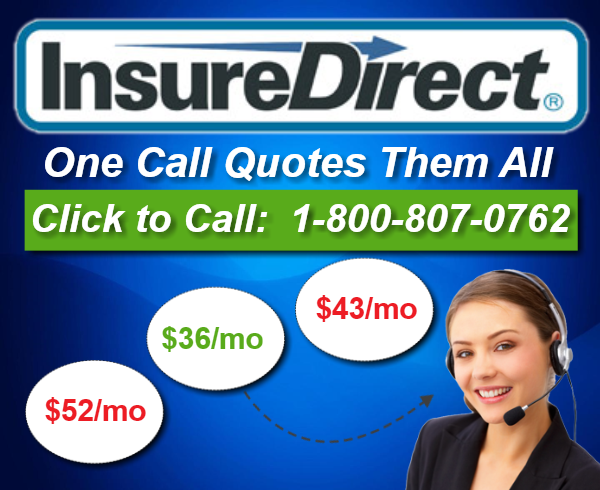 Insuredirect.com is not an insurance agency. After you fill out the lead form and submit your quote application via our web site, Insuredirect.com matches you to agents or carriers who can meet your insurance needs. We accomplish this in part using the information you provide in your quote application to help our partners match you up to agents or carriers in their networks. These agents or carriers may contact you through email, telephone, postal mail or other communications to review your application and sell you a policy. You may be contacted by one or multiple agents and/or insurance carriers, depending on answers in your application. We cannot guarantee that you will receive an insurance quote. By submitting a quote request, you acknowledge that partner’s require you to agree that they will obtain a consumer report or credit score from a consumer reporting agency. Our partners do not have the right to obtain a consumer credit report without your written instruction which you are granting by clicking the submit button. Insuredirect.com may contain links to third party sites. These links may direct you to articles, information, additional offers or other relevant information and resources. By providing these links, Insuredirect.com does not necessarily endorse companies related to the links. Instead, these links are provided for your convenience and should be used at your own discretion. We encourage you to read the privacy policies of our partner as well as any third party sites as Insuredirect.com is not responsible for the privacy practices of other sites. While Insuredirect.com intends all information on the website to be reliable and accurate, errors do occur and we reserve the right to make any changes and/or additions to our site at any time. Insuredirect.com is not responsible for any delays, errors or other issues with matching your information with our partners. We are also not responsible for any errors or other issues resulting from inaccurate or incorrectly entered information in the application. Insuredirect.com, INCLUDING, WITHOUT LIMITATION, ALL SERVICES, CONTENT, FUNCTIONS AND MATERIALS, IS PROVIDED “AS IS,” “AS AVAILABLE”, WITHOUT WARRANTY OF ANY KIND, EITHER EXPRESS OR IMPLIED, INCLUDING, WITHOUT LIMITATION, ANY WARRANTY FOR INFORMATION, DATA, DATA PROCESSING SERVICES, OR UNINTERRUPTED ACCESS, ANY WARRANTIES CONCERNING THE AVAILABILITY, ACCURACY, USEFULNESS, OR CONTENT OF INFORMATION, AND ANY WARRANTIES OF TITLE, NON-INFRINGEMENT, MERCHANTABILITY OR FITNESS FOR A PARTICULAR PURPOSE, AND WE HEREBY DISCLAIM ANY AND ALL SUCH WARRANTIES, EXPRESS AND IMPLIED. WE DO NOT WARRANT THAT THE SITE OR THE SERVICES, CONTENT, FUNCTIONS OR MATERIALS CONTAINED THEREIN WILL BE TIMELY, SECURE, UNINTERRUPTED OR ERROR FREE, OR THAT DEFECTS WILL BE CORRECTED. WE MAKE NO WARRANTY THAT THE SITE WILL MEET USERS’ REQUIREMENTS. NO ADVICE, RESULTS OR INFORMATION, WHETHER ORAL OR WRITTEN, OBTAINED BY YOU FROM US OR THROUGH THE SITE SHALL CREATE ANY WARRANTY NOT EXPRESSLY MADE HEREIN. IF YOU ARE DISSATISFIED WITH THE SITE, YOUR SOLE REMEDY IS TO DISCONTINUE USING THE SITE. TO THE FULLEST EXTENT PERMITTED BY APPLICABLE LAWS, IN NO EVENT SHALL THE SITE PROPRIETOR OR ANY OF ITS DIRECTORS, OFFICERS, EMPLOYEES, AGENTS, AFFILIATES, OR CONTENT OR SERVICE PROVIDERS BE LIABILE FOR ANY LOSSES AND EXPENSES OF WHATEVER NATURE AND HOWSOEVER ARISING INCLUDING, BUT NOT LIMITED TO, ANY DIRECT, INDIRECT, SPECIAL, PUNITIVE, EXEMPLARY OR CONSEQUENTIAL DAMAGES, LOSS OF USE, LOSS OF DATA, LOSS CAUSED BY A VIRUS, LOSS OF INCOME OR PROFIT, LOSS OF OR DAMAGE TO PROPERTY, CLAIMS OF THIRD PARTIES, OR OTHER LOSSES OF ANY KIND OR CHARACTER, EVEN IF WE HAVE BEEN ADVISED OF THE POSSIBILITY OF SUCH DAMAGES OR LOSSES, ARISING OUT OF OR IN CONNECTION WITH THE USE OF THE SITE. THIS LIMITATION OF LIABILITY APPLIES WHETHER THE ALLEGED LIABILITY IS BASED ON CONTRACT, NEGLIGENCE, TORT, STRICT LIABILITY OR ANY OTHER BASIS. Insuredirect.com reserves the right to modify or discontinue the site with or without notice whether temporary or permanent. You or any third party agree not to hold Insuredirect.com liable for discontinuing the site for any amount of time. This Agreement will be governed and construed in accordance with the laws of the United States and specifically the State of Insuredirect.com. You agree any disputes in regards to this Agreement will be heard in the appropriate court in the state of Insuredirect.com.